This is a classical formula used for pain in the lower body especially in the low back, knees, legs and feet. Issues such as arthritis, weakness and heaviness of the legs, soreness, numbness and stiffness of the back or legs are all perfect candidates for this formula. Back and Knee Formula is also known as Du Huo Ji Sheng Tang. 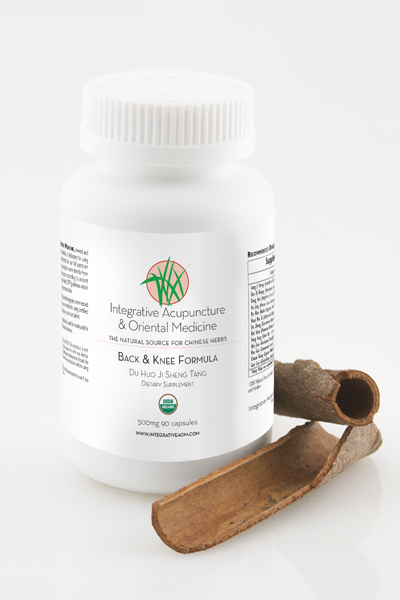 This is a classical formula used for pain in the lower body, especially in the low back, knees, legs and feet. Issues such as arthritis, weakness and heaviness of the legs, soreness, numbness and stiffness of the back or legs are all perfect candidates for this formula. The goal of this formula is to encourage the normal flow of qi and remove obstruction. In Western terminology it has been shown to inhibit inflammation by enhancing microphage activity and increasing blood circulation. Both of these activities are essential for healing inflamed tissues, restoring normal function and mitigating further degeneration. In Chinese medicine the kidney organ system keeps the bones of the back, legs and knees strong and healthy while the liver organ system nourishes the sinews, tendons and ligaments. The herbs in this formula have been used for centuries to strengthen strengthen the kidney and liver organ systems and nourish vital energy. Ingredients: Organic Mulberry Stem (Sang Ji Sheng), Organic Rehmannia (Shu Di Huang), Organic Angelica Root (Dang Gui), Organic Poria (Fu Ling), Organic Achyranthes Root (Huai Niu Xi), Organic Eucommia Bark ( Du Zhong), Organic White Peony Root (Bai Shao), Organic Siler Root (Fang Feng), Organic Lugisticum (Chuan Xiong), Organic Licorice (Gan Cao). This herb is very effective for arthritis type pain. Many kinds of arthritis pain are worse in the damp cold weather. In Chinese medicine an imbalance of cold, wind, heat or dampness in the body can cause arthritic type pain. This herb is known to expel wind, cold and damp from the body and alleviate pain. It was also used in Europe by the Druids to alleviate arthritic pain. The tuber of this herb is used medicinally. The plant is indigenous to China, Japan and Korea. Rehmannia tuber can be used fresh and dried. It’s taste is very rich, sweet and dense. In Chinese medicine rehmannia is used to tonify yin and blood. In our Back and Knee formula it assists the repair of tendons, ligaments and bone by strengthening the liver and kidney organ systems. Radix Angelicae Sinensis, Angelica, has a special affinity for female gynecological disorders. It is known to help balance hormone levels and provides supplemental estrogen. Additionally, Angelica relaxes smooth muscle tissue in the body and increases circulation. In Chinese medicine terminology, it enriches and moves blood, it is very good at reducing pain anywhere in the body. Poria is a type of fungus that most often grows on pine trees. It is gathered from the trees, cut into slices and shade dried. Poria is used in a wide range of Chinese formulas. It strengthens digestion and relaxes the mind. 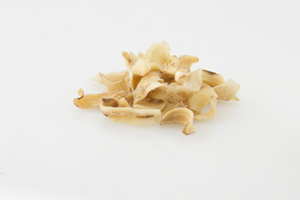 It is most well known for expelling dampness in Chinese medicine. Dampness is like a swamp, that heavy bogged down feeling. Dampness may result in bloating, depression, and feeling unmotivated. Poria is one of the most important herbs for draining the swamp, dampness, and restoring a clear calm mind. There are many species of Angelica used in Chinese herbal medicine and over 60 species that grow worldwide. Du Huo refers to angelica pubescens. In Chinese medicine, Angelica’s works to eliminate wind, dampness, and cold in the body to stop pain. It has an anti-inflammatory effect and can treat either chronic or acute aches and pains. It especially helps pain conditions such as arthritis that are worse with cold and damp. This is herb is said to strengthen the sinews and the low back. It has been shown in laboratory experiments to have analgesic effects. In Chinese medicine in nourishes the Liver and Kidney yin. Eucommia ulmoides is a rare plant species and a member of the rubber tree family. It is a very ancient tree. It has become more rare in recent times but luckily the tree is not killed to obtain the bark. Eucommia bark is great for connective tissue disorders. It relieves soreness and inflammation affecting the lower body especially the low back, hips, knees and ankles. It heals injured and weak tissue and will help make your backache a thing of the past! In Chinese medicine it is also used to treat infertility and threatened miscarriage. It is very strengthening to the liver and kidney meridians. 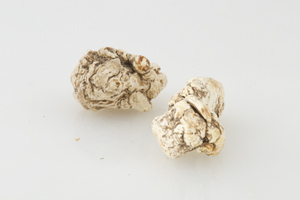 White peony root is one of the most used herbs in the Chinese pharmacopeia. It is a wonderful tonic herb. Peony root purifies the blood, reduces pain, relaxes muscles, relieves cramps and spasms anywhere in the body, even menstrual cramps. In our Stress Free Formula it helps to relax the musculoskeletal system which often responds to stress with tension. It can also help lower stress induced high blood pressure. Siler Root grows mostly in Mongolia and Jilin regions of China. It name means “guard against wind.” It is effective in treating joint pain especially cases of rheumatoid and osteoarthritis. It will reduced pain and inflammation associated with these disorders. In Chinese medicine spasms, tremors, seizures and stroke are due to excess wind in the body. Siler root is a well known herb for treating muscular spasms. There are over 400 species in the gentian family. It is a widely used herb all over the world and included in many “Bitters” formulas. 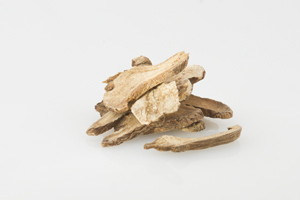 Gentiana macrophylla root, Qin Jiao, is one of the most important herbs used in formulas for rheumatoid arthritis because of its ability to reduce pain. With its sweet, rich, and spicy taste, who doesn’t love cinnamon? Cinnamon is referenced in China’s most revered herbal text the Shanghan Lun written 1,850 years ago. The Cinnamon tree continues to be one of China’s most important herbs for many centuries. Cinnamon tree likes the warmth and grows in the south of China where it is known as a “solar plant.” The energy of the sun is rich in yang qi, or warming energy. Cinnamon has this effect in the body too. It is warming and promotes circulation in the body to decrease pain and stiffness. Chuan Xiong is also known commonly as ligusticum or Chinese Lovage. It grows widely all over China and Korea. The root and rhizome are used in herbal preparations and even sometimes added to cosmetics and beverages to enhance flavor and scent. 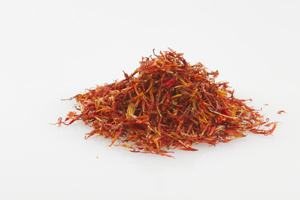 Lugisticum helps move blood and qi,, expel wind from the body to decrease pain. In Chinese medicine often pain indicates a level of stagnation. Blood flow is not optimum, perhaps because of an old injury, aging or sluggish circulation and lymph flow. Lovage helps remove this blockage to heal injured tissues. It is also used to reduce pain from dysmenorrhea, and headaches. Licorice has been used medicinally all over the world for centuries. It is arguably one of the most important herbs in the Chinese pharmacopeia. One of the reasons it is so important in Chinese medicine is that it harmonizes the actions of other herbs. It is frequently baked in honey (Zhi Gan Cao) before being included in herbal formulas. It has anti-viral and anti-inflammatory properties.